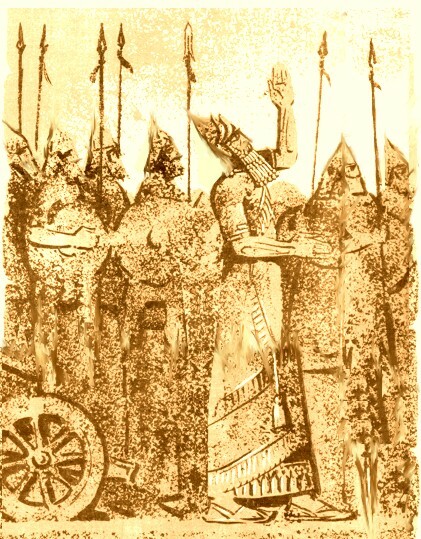 THE WARRIOR KINGS OF ARARAT WERE THE CHALDEAN ORACLES OF HALDI. 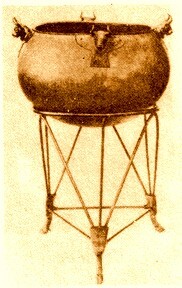 AND TERRESTRIAL ESSENCE INTO ONE COMPLETED DIVINE SPHERE [READ BELOW]. shortages. 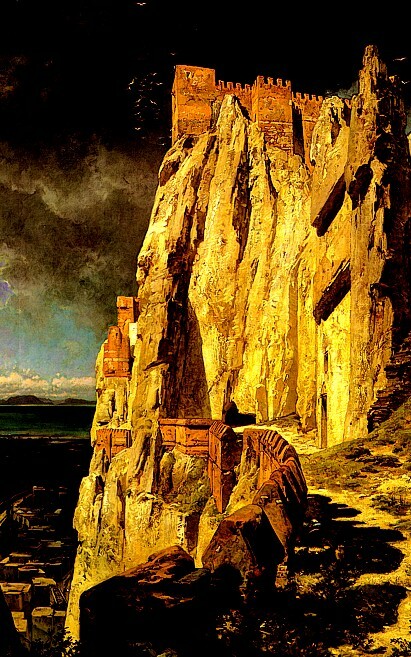 Armenians of Ararat were master builders and innovators. Huge canals were often drilled through blocking cliffs. Parts of the Araratian canal are still in use by the local inhabitants. 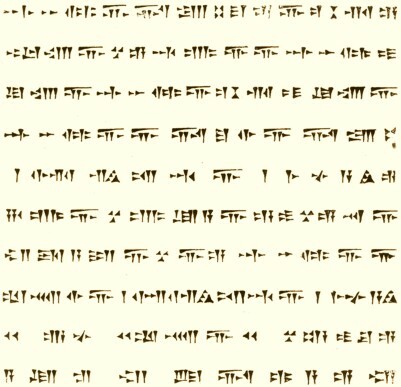 Mowsēs χorēnac‘i -- the Father of Armenian History -- tells us that during the successive reigns of successors of King Menua -- Argišti I [Ara I] and Sardur II, a number of innovations were erected throughout the city. Further Reading See Culture of Ararat of The Chronicle Click Here. 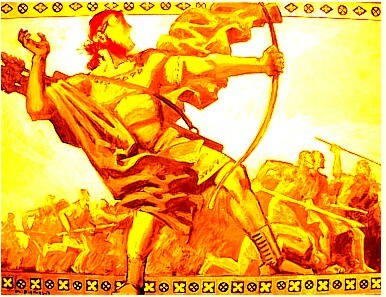 HEROIC DEFENSE OF CAPITAL TUŠPA [TOSP] AGAINST THE ASSYRIAN INVADERS. 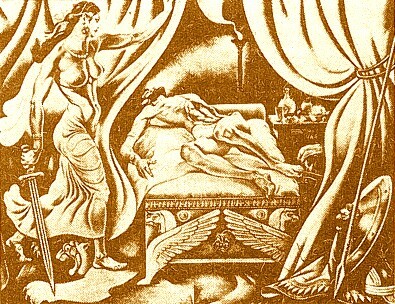 RELIEF FROM AŠŠURNASIPAL'S PALACE. 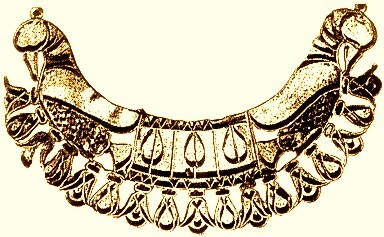 IXTH CENTURY BC. 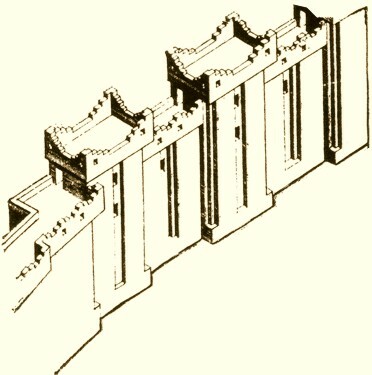 THE CAPITAL'S HUGE DEFENSIVE WALLS SAVED THE INHABITANTS COUNTLESS TIMES. 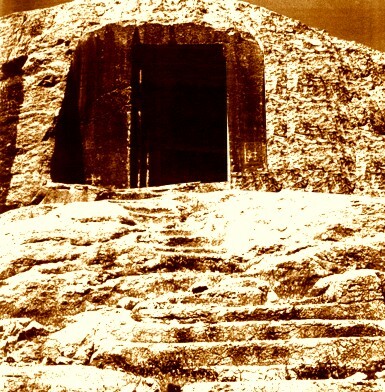 THE HUGE DOOR OF MHER [MIHR-MITHRAS] MOUNTAIN CAVE OVERLOOKING VAN. 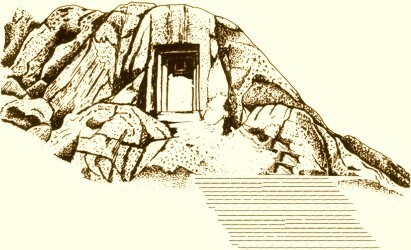 THE CAVE IS COVERED WITH CUNEIFORM INSCRIPTIONS OF IŠPUHINI AND MENUA. FROM INJUSTICE AND CRUELTY OF TYRANTS. THE SPECTACULAR VIEW FROM THE HIGH CLIFFS OVERLOOKING THE CAPITAL. 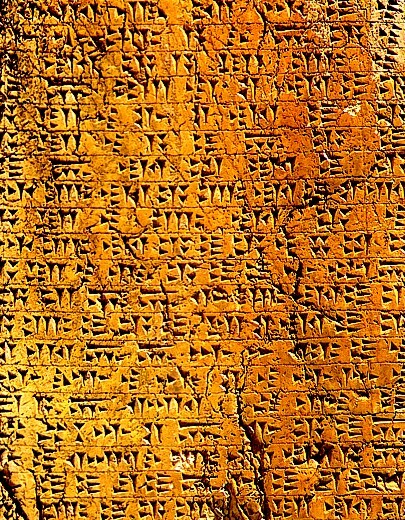 CUNEIFORM INSCRIPTIONS ON THE ROYAL CHAMBER OF KING ARGIŠTI I. OR DARK RAVEN [CORVUS CORAX] -- THE SENTINEL OF THE ETERNAL FLAME. 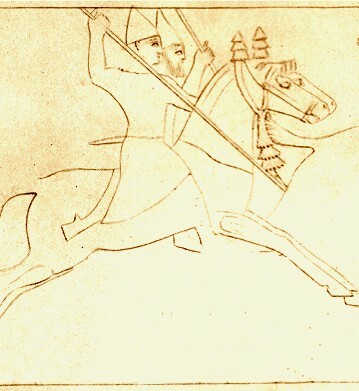 The culture of Ararat influenced many peoples of the ancient world including among others the Scythians, Cimmerians and Medians. 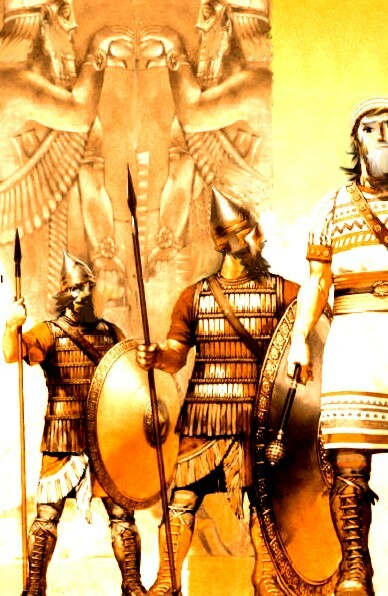 The Achaemenid Persians -- the successors of the Medians, modeled their culture and civilization after that of the Kingdom of Ararat. They were in a close relationship of trade and commerce with a number of important cities of Ararat. Van was also an important center of weaponry making -- supplying much of the weaponry to the arsenal of the Kingdom's armed forces. 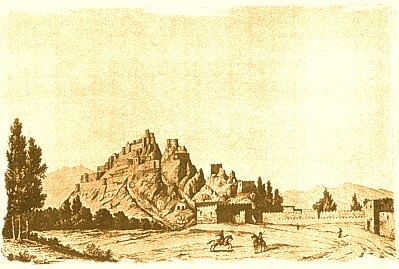 New fortifications and towers were being continuously built in order to defend the prosperity of the city. 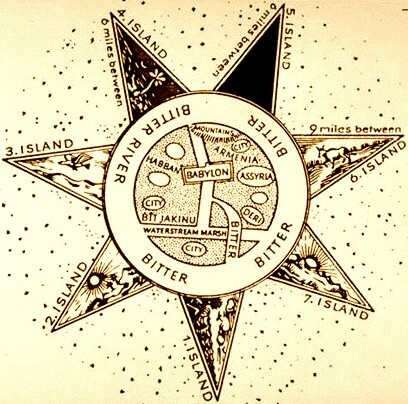 INTERPRETATIVE REDRAWING OF THE ORIGINAL [K]HALDEAN MAP FROM BABYLON. FROM ITS HIGHLAND SOURCES WITH THE WATERS OF TIGRIS AND EUPHRATES. TRADITIONAL FOLK WAY OF THE ARMENIC COMMUNITIES OF ARARAT. 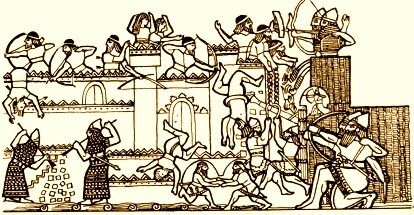 In 735, the Assyrian King Tiglathpalaser, launched an incursion into north -- into the domain of Ararat. The rapid expansion of Ararat and particularly its dominance of Northern Mesopotamia, Syria and Eastern Anatolia, were successfully blocking the Assyrian advances further north and northwest. 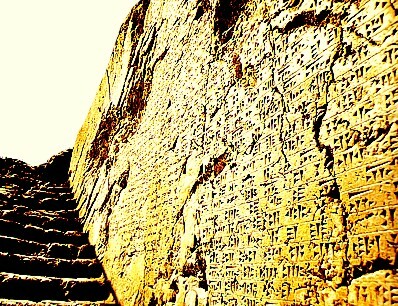 THE HOLY HIGHLAND -- WITH THE CUNEIFORM INSCRIPTION -- THE SEAT OF GOD. 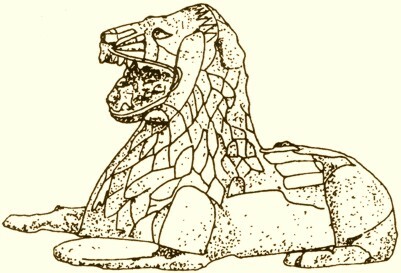 CLOSE UP OF THE DOOR [GATE] OF LION MHER [MIHR]. FIGHTING CAVALIERS OF THE ANCIENT WORLD. 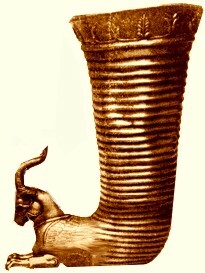 THE REIGN OF DARIUS I.
WARRIOR'S GOLDEN DRINKING GOBLET IN A FORM OF A HORNED GRIFFON. EKEŁEAC‛ PROVINCE. 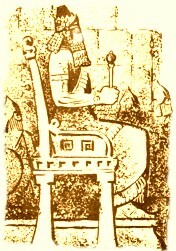 VIIITH CENTURY BC. PRECIOUS GEMS. 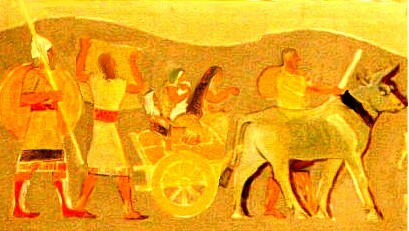 VIIITH CENTURY BC. 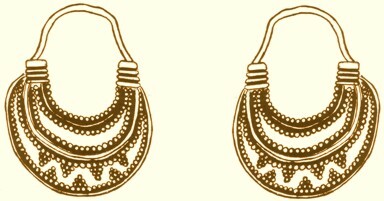 GOLD EARRINGS FROM TEYŠEBAINI [KARMIR BLUR]. VIITH CENTURY BC. WITH THE SYMBOL OF MACROCOSM. TEYŠEBAINI [KARMIR BLUR -- RED HILL]. 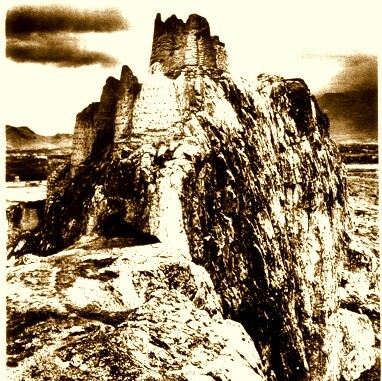 VIITH CENTURY BC. 20 KM. EAST OF ERZNKA -- FOUNDED DURING THE REIGN OF ARGIŠTI II [714-680 BC]. 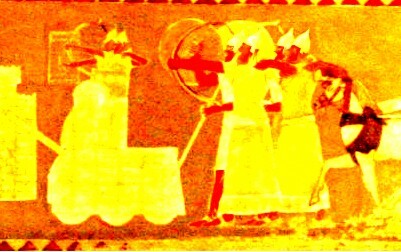 WAR GODS HALDI AND TEYŠUB ON THE BELT OF ARMAN WARRIOR. 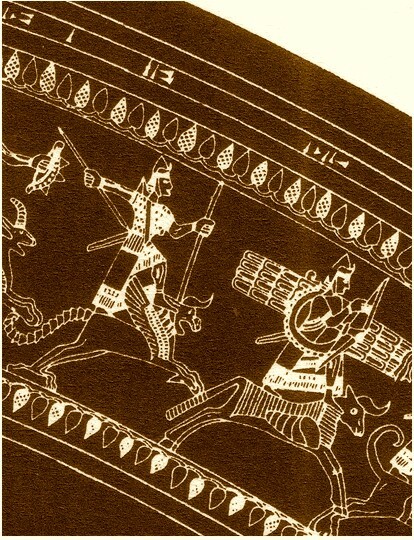 WINGED GRIFFON AND THE WAR GOD WITH THE SACRED SUN DISK UPON THE BULL. AND NECKLACE, WITH REMAINS OF BLUE INLAY IN THE EYES. 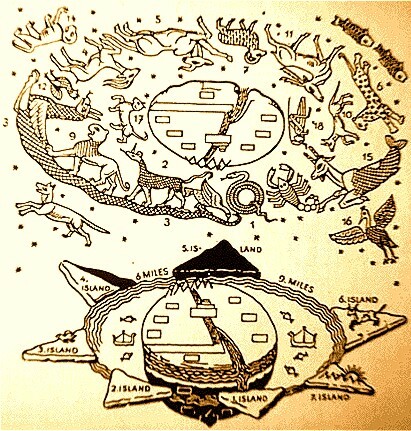 century BC, the ancient Aramian Royal House of Ararat was succeeded by the Orontids [Oriontids]. 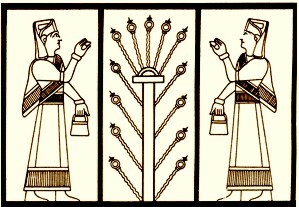 The Orontids or the Er-uandunis had blood ties to the previous dynasty and followed in a natural succession to the Kingdom. close blood ties -- after the expiration of the last male heir to the throne, Ruša IV, Eruand I became the new reigning monarch.